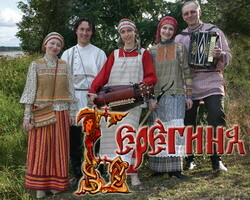 ABOUT THE GROUP - Folk group "Bereginja"
BEREGINJA play traditional folk songs from different regions of Russia in a unique, authentic way - far from easy-listening Kalinka-sounds - with five great voices, balalaika, harmonica, hurdy-gurdy, folk-flutes and special rhythm instruments. The group performs in traditional costumes and enrichens the program with dance and theatre elements. Page generated in 0.064127 seconds.